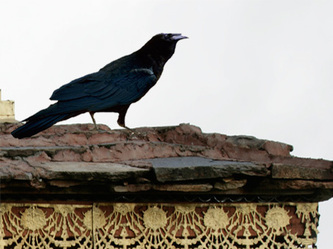 The Raven is the Bhutan's national bird. It represents one of the most powerful deities of the country, Jarog Dongchen. 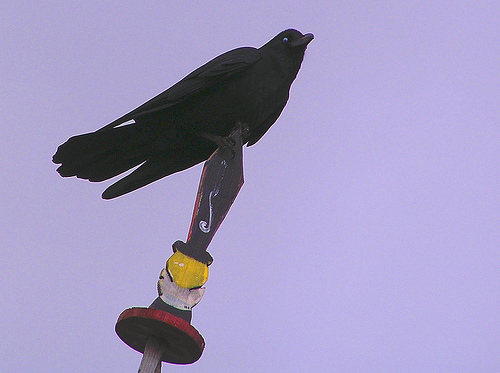 Raven is thus known in the local language as ‘Jarog’. The Royal Raven Crown or Druk Gyalpo represents Bhutan's reverence for these birds and the faith of Bhutanese in their protective deity. Jarog Dongchen along with Yeshey Gonpo (Mahakala) and Palden Lhamo (Mahakali) form the Divine Trinity, who protects the King and the people of Bhutan from harm and safeguard their well being. At one time, it was a capital crime to kill a Raven in Bhutan. 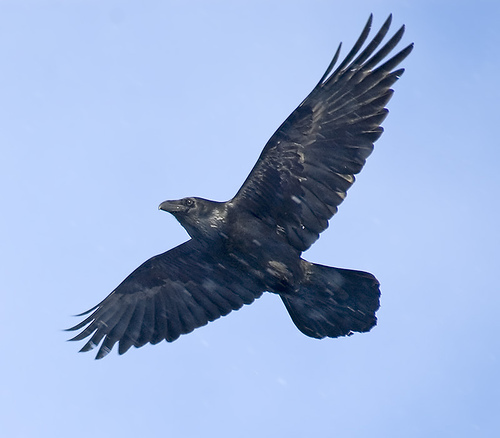 One can still see ravens nesting in monasteries and dzongs throughout Bhutan. Hens give about 5 to 6 eggs at once and incubate them, only to be occasionally relieved by the males. The young ones hatch in 19 to 23 days and for 40 to 42 days, they remain in the nest and are looked after and fed by adults with the food brought in their special throat sac. It has been observed that even the young ones attack large predators trying to approach their nest bravely. It is believed that the guardian Deity, Mahakala, takes the form of a raven to guide the country’s unifier, Shabdrung Ngawang Namgyel, to Bhutan. Namgyel founded Bhutan in the 17th century. The raven-headed form of Mahakala is known as Lego Jaro Dongchen. In 1885, the Trongsa Penlop Jigme Namgyal (father of HM Ugyen Wangchuck, the first king of Bhutan) wore the Raven Crown to the war with the British as his helmet. Since then, it became a model for all future crowns of the Wangchuk dynasty.